Hey nommers! 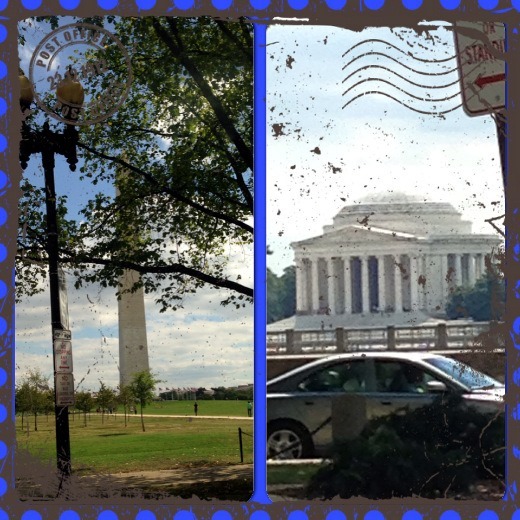 You haven’t heard from me in a few days because I spent the first half of my week in Washington DC at a meeting for work. In my next bi-weekly meal recap, I’ll be showing you where I ate and will have pics to share. But for now, I am back in the nomming business. Today I’m here to share my experience trying out a new soup recipe. Recently Eat, Live, Run blogged about her take on Bon Appetit’s recipe for Spicy Pork and Mustard Green Soup, which inspired me to try the recipe for myself. 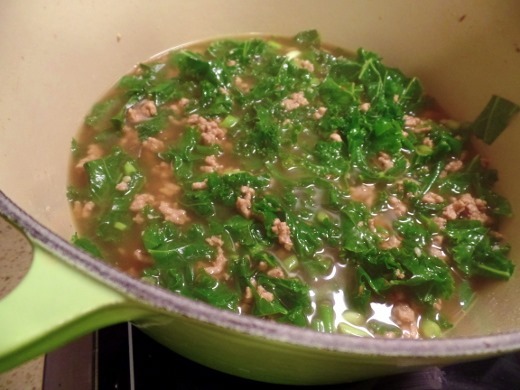 As you may know, soups are my very favorite thing to cook. 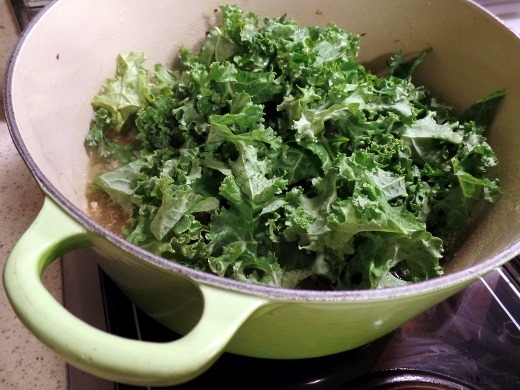 I’ve also been on a kale kick lately – like every other person in the blogosphere since 2012. Seriously, kale chips, sautéed kale, kale in my soup, kale in my smoothie, kale in my juice, kale salad, ALL THE KALE. VITAMIN A FOR THE WIN. 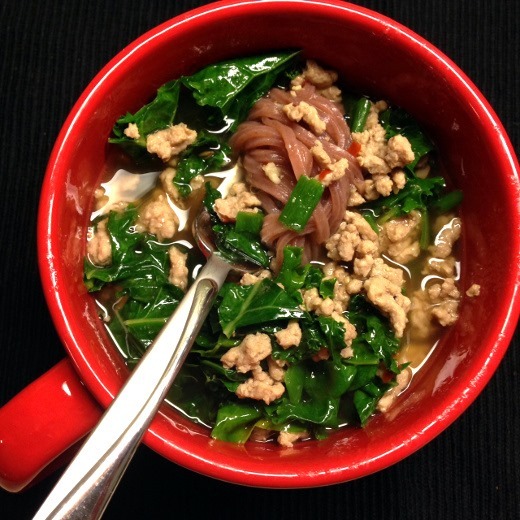 Anyway, the protein in this soup is ground pork, which is very budget friendly. You’ll just need one half of a pound. 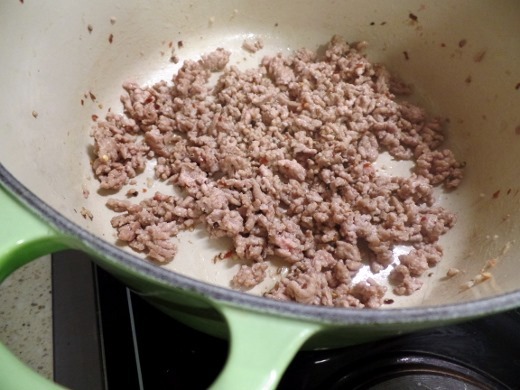 To the cooked ground pork and seasonings, reduced-sodium chicken broth is added, and the soup is allowed to simmer for several minutes. Gotta develop that flavah. Next, KALE. ALL THE KALE. Okay, not ALL the kale. About four cups’ worth. Or mustard greens. Or whatever greens make you happy. Pretty much all green veggies make me happy. I try to include at least one with my dinner as often as possible. More green veggies because, again, they equal happiness. This time: scallions. I kind of feel like you could add scallions to literally any savory dish and it would be good. Like, I am struggling to thing of something that would not be good with scallions. Can you think of anything? I can’t. 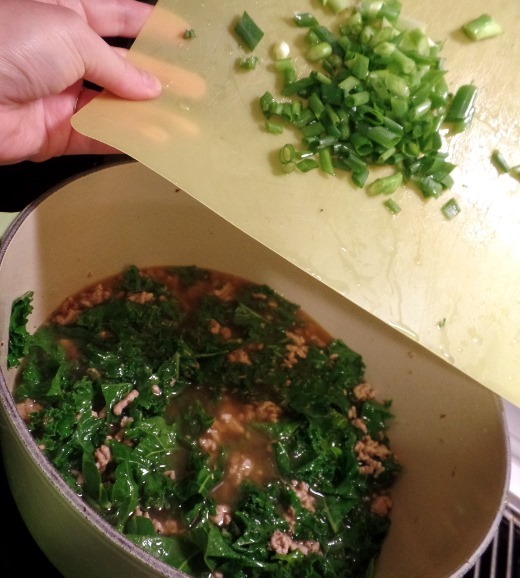 Once the greens are tender, which is going to be about three minutes after you’ve added them, the soup can be spooned over cooked rice noodles. I used these crazy black rice noodles, because my grocery store was sold out of both regular and brown rice noodles. Okay, I guess they’re not that cRaZy but I’d never seen them before! 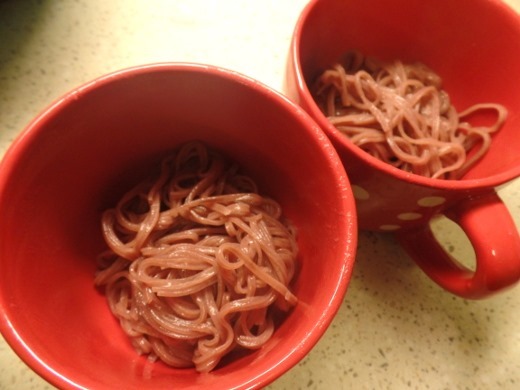 They were fine, but brown rice noodles are still my favorite type of rice noodle. The black rice noodles turned a very unique purple color after cooking. Pretty neat-o. 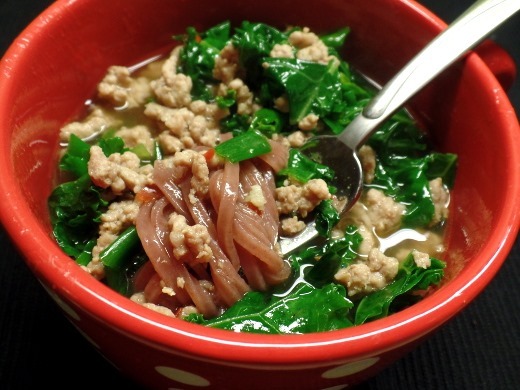 This healthy soup packs a LOT of flavor! 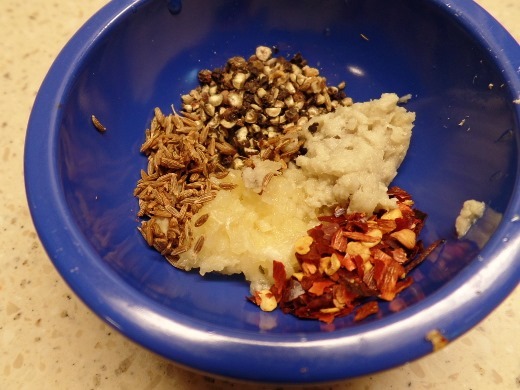 Peppercorn heat, ginger sweet, smoky cumin, savory fish sauce, and salty soy sauce. Yumtastic! Huz was a big fan too. We will most definitely be making this again.